Flavor Text: "The corpse is just desert..."
Response timing was kinda weirdly late. The term for dying by getting wounded too much is destroy. Now, with the Feed Her Young and The Festival restriction, isn't this card more appealing to use? 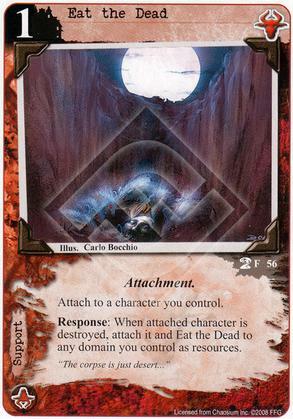 I'm making a Shub/Cthulhu deck at the moment which includes Khopesh and I think it might find a place there to turn the destined to be destroyed Khopesh-bearing weenies at the early stages of the game into resources. Thoughts? Yes, that makes sense. It's a little slower and it's possible for your opponent to find a way to sacrifice, bounce, insane, etc.. your guy to prevent it going off but it's certainly a reasonable option in the sort of deck you're describing.